We often don't get the opportunity to see "behind the scenes" tours of businesses that we deal with on a regular basis, but today, we are making an exception. 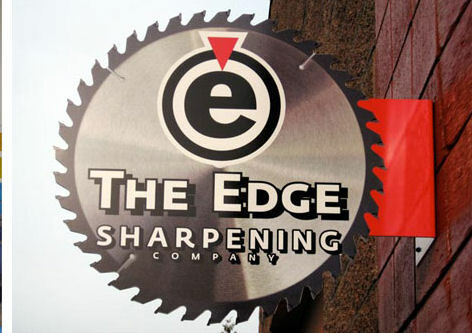 We have not only a behind the scenes look, but and actual guided tour of a bit and blade sharpening business called "The Edge". We get to see what the machinery looks like that sharpens our bits and blades and how it is use. In this video you will get to see a variety of sharpening machinery and tools and in some cases we will get to see how they work and what they do. Our tour guide is sharpening expert and The Edge Owner, Tom Saxby, who has a remarkable sense of what it takes to provide sharp blades for specific needs at competitive prices. In this video we will get to see what a spiral sharpening machine looks like and how it work, we will see how blade sharpening machine for jointer planers works and including a variety of blade sharpening machinery. There are two very fascinating machines that are particularly interesting. One is the CNC saw blade sharpener the other is a machine that actually makes shaper type blades. Learning the tricks of how to use tools can make your woodworing life so - much - easier. The router is one of the perfect tools for making multiple, identical parts or components. Of course, you normally would need a router table with this as well, but depending on the part and the size, these can be done free hand, as long as the parts are held down firmly, and it's a great opportunity to use a "starter pin" to ease the wood into so that it makes a smoother transition. In terms of a bit, a flush trim bit all that is needed. There are a few versions of these bits in both 1/4" and 1/2" shanks. You can get bits with bearing at the top of the bit, or at the bottom of the bit and you can even get some with bears at both top and bottom. The bits with the two bears are best because it gives you more options. The actual template material that works best is 1/4" hardboard which is readily available at most hardware and wood supply stores. Although there is also a 1/8" version, which is also painted white on one side and is very nice for drawing your template outline on, the thinner version means more risk of running off the template which can ruin it, and your work piece. The finished wood products from using this pattern making method are smooth well shaped products that are ready for the next step in the production of the finished product. Pattern making can be used for a variety of woodworking projects but one of the best uses is in making "blanK" inserts for your table saw. Working with routers and router tables is often one of the most frightening tools for new users and often one of the most mis-understood by more seasoned woodworkers. Part of the reason for the fear and misunderstanding is that this tool is pretty unique ... the router spins at speeds that makes one think it could easily lift-off the workroom floor and if you are not careful, it can ruin a piece of wood on you pretty quickly or fling it out of your hand before you know what happened. The truth is, working with routers and router tables is not really not that daunting when you have a baisic knowledge of the tool and an understanding on some of it's principals of operation. The first thing that anyone using a router will do is to decide on what bit they want to use. Many of todays routers like Bosche, DeWalt, Makita and Freud will use both 1/4 inch or 1/2 inch shank router bits and will include both 1/4 inch and 1/2 in collets with the tool. The collet is the name for the chuck or bit holder for the router. When installing any bit in a router, it is important that it be seated properly. This means pushing bit all the way into the collet as far is it will go, then drawing back out about 1/32 of an inch. This draw back is to allow for heat expansion. Router bits can heat up pretty quickly while cutting through wood and they need a small bit of area to expand into at the bottom of the collet. Next the bit needs to be tightened firmly. This does not mean you need to crank the nut so tightly you damage the machine, but it does need to be tight enough that the bit will not spin inside the collet or have any chance of coming out.